Your wedding day promises so much, the start of the rest of a happy life together. Put your best teeth forward on the day with Zoom Teeth Whitening at Robert Duhig Dental! You’ll look back on your wedding photographs years from now and smile. A wry smile at a crazy hair-do or fashion choice, perhaps reminiscing about older family members no longer with us. And your biggest smiles will be saved for the photos of the happy couple together. Having lovely, white teeth in your wedding photographs will remind you of the time in your life when you were so happy and poised on the verge of wonderful shared adventures: the start of your family’s journey together, the next step into the big, bold world of adult responsibilities. A gorgeous, sparkling smile speaks of health, happiness and harmony – a perfect message to send on your wedding day. Many people view weddings as a stressful challenge. They want to lose weight, get in shape and smarten up before the big day. It’s important to remember that your partner loves you exactly as you are, but we like to view this special day as an opportunity to be the best version of YOU that you can possibly be. And if you’re self-conscious about your smile, having your teeth professionally whitened can make all the difference. Many couples will be in the same position as you and want to ensure they’re looking their best on the big day. Wedding season is a HUGELY busy time for dentists so if you want to get your teeth whitened, you’d best ensure that you book your appointment sooner rather than later! Zoom Teeth Whitening offers dynamic whitening results that can leave your pearly whites up to EIGHT SHADES whiter! A post-treatment gel will be applied to protect any sensitivity and your dentist can cleverly tailor your treatment plan to be the perfect fit for you. The lead-up to a wedding can cause worries but a bright, confident smile does not have to be one of them. Organise those necessary procedures early on to cut down on anxiety. 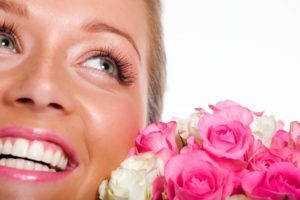 The happiest day of your life approaches – invest in the brightest smile! Contact Robert Duhig Dental today to arrange your Zoom Teeth Whitening Procedure. We specialise in beautiful smiles!